A great championship gave us a great champion. 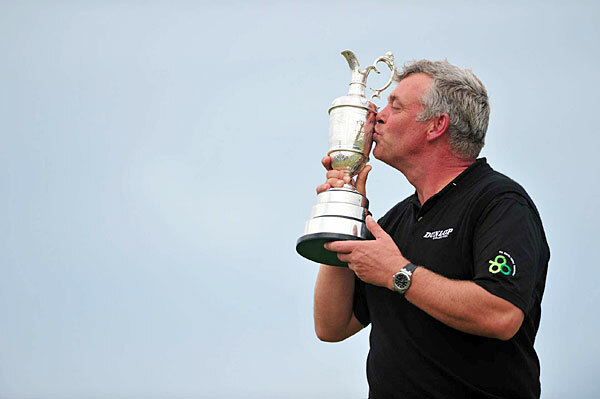 Darren Clarke from Northern Ireland. Much has been written about him and the twists and turns his life has taken. Here’s the piece from the Belfast Telegraph. He’s the third Ulsterman to win a major out of the last six, which is extraordinary. Phil Mickelson has lots of golf left in him. He finished second and shot a 30 on the front nine before fading over the final nine. It was good to see him do well and to see him enjoying it, too. I love watching golfers having fun as they’re playing. Miguel Angel Jimenez made quite an impression with his warm-up. He’s a total clown and seems to have a seriously great time playing golf. He hit one of the most amazing shots of the tournament last year in St. Andrews. Phil, too, was laughing and joking around as he played his round with Anthony Kim, and was messing around with Jimenez on the practice tee before the final round. Darren Clarke played with Dustin Johnson on Sunday and they were chatting, laughing, and walking together the whole round. This is so refreshing. When Tiger Woods is in contention, it’s riveting, but he doesn’t seem to enjoy the game, and is always blowing up when things don’t go just right for him. It’s just nice to watch guys out there having a good time. This sort of thing is constant. He’s a brilliant story-teller and an understated commentator. There is simply no one like him. If there were a school for sportscasters, it would consist of listening to Peter Alliss doing the last twenty-five Open Championships and Vin Scully doing a season’s worth of Dodgers games.